The Atlantis Bookshop was set up by magicians for magicians and we have kept it that way. It was founded in 1922 by Michael Houghton, a young Jewish lad full of drive, poetry, Theosophy and Magic and his great friend Paul Brunton. 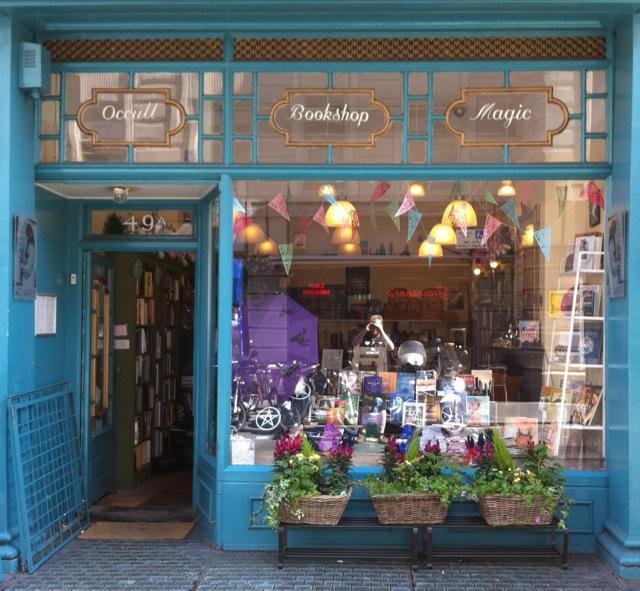 Michael Houghton ran The Atlantis Bookshop successfully until his death in the early 1960's. He knew everyone and was very involved with Crowley and Spare. X marks the spot downstairs where Gerald Gardner had his first coven. Michael Houghton published High Magic's Aid in 1949 using his own name and the Atlantis address as a fixed point for people interested in witchcraft to make contact. To Know, to Will, to Dare and to keep Silent were very much on their minds as the Craft was illegal until 1951. Paul Brunton went off to travel and wrote books bringing his experiences in India and Egypt to life for other Seekers. He was the first person to popularise words like meditation, asana, and Yoga to the mass of people in the West and was very successful. He became quite a Guru and eventually made America his home. The Collins's were young idealists who had too many kids and not enough money before Geraldine's Dad came into Atlantis one day. It changed his life as Michael Houghton said "Take a good look around young man as you will own the place one day". That prophecy came true and as they say, the rest is history. Wally Collins - as mentioned in Doreen Valiente's diaries - was with the witches in the late 1940's. Kath Collins had a strong Celtic streak running through her and had learnt a lot from her outwardly respectable Mother. She made it clear Geraldine had to wait until she was nine before her grandmother was allowed to teach her the cards. She was allowed to sit quietly and watch the readings though. Her Granny had been taught by a housekeeper and a treasured possession is a pack of cards that have the meanings printed on them that correspond with many that the family use. Ross Nichols' day job was to run a "Crammer", a business to provide extra tutoring for teenage boys. He edited the prestigious Isis magazine and later produced collections of poetry and wrote many Druid rituals. Always a Sun worshipper, he used the same Nudist colony as the post-war witches. He was always charming, slightly aloof and deeply tanned. His year round tan made his skin look quite gnarled and Geraldine called him Old Tree - which he rather enjoyed. Austin Spare was lovely according to the people who knew him. Crazy as crazy but still contactable in conversation. Very poor, very ill, as a cartographer of the Unknown, driven by his Genius, he was entitled to be a bit Out There socially really. Our collections of his art and personal artefacts began in the late 1970's when Geraldine 'had a feeling' and went into a murky storeroom and found two pastels by him. Michael Houghton had stocks of first editions that gathered dust for decades impossible as that now seems. Geraldine curated a 1986 exhibition to celebrate 100 years since his birth and the catalogue, The Divine Draughtsman, has the first full-colour images outside part-works like Man, Myth and Magic. The Beskins have now staged 5 big exhibitions and have had the honour of the Spare family lending to them as well as work from other significant private collections. The grandfather of modern witchcraft was a great friend of our founder, Michael Houghton and of Geraldine's Dad. She will tell anyone who stands still long enough about the time she saw him and her father coming up from the basement laughing together one afternoon when she was a girl. She wasn't introduced but was - and is - thrilled to have seen the King of the Witches. Could anyone really call themselves a friend of Crowley, the most capricious of Beasts? Michael Houghton did. Michael was also massively useful to Crowley as a 'crowd funder' of sorts to get The Book of Thoth published - despite there being a war on for some of the time. He also published 777 very handsomely. He must have had a very forbearing nature as he 'lent' Crowley beautiful copies of his books that he knew he'd never see again as they would be sold at exorbitant prices to the latest potential acolyte. Crowley worked closely with Frieda, Lady Harris and also Gerald Yorke in later years. Doreen was a chum of Geraldine's Mother and they spent many an afternoon together. She was tallish, a bit gawky, used to wear a Welsh wool cape and was essentially sweet natured. She was an encourager by nature too. She gave grace and elegance to the Book of Shadow and thousands of people hold her words dear to their hearts.